Gaiayoga cells are meetings free of charge, open to all. At this time, they exist in more than 7 countries. The meetings last one hour and generally take place once a week. At the School of Conscious Life, the cell takes place on Wedenesday evenings at 8pm. To know whether there is a cell near you, click here. To learn what a cell is, continue reading. What is a « Cell »? 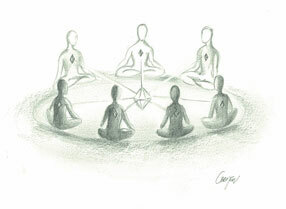 A Gaiayoga Cell is a group of at least seven people (adults and/or children) who meet in order to sing for Earth. It is a cell of the great body of Gaia, a reunion of souls who have chosen to actively and consciously participate in their evolution, the evolution of the planet and of humanity, and the evolution of all of creation. Seated in a circle, you sing mantras and sacred chants while looking each other in the eyes. 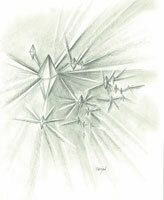 This forms an energy field, which allows the formation of a central crystal in the subtle dimension. Between the songs, there are sacred silences conducive to inner listening, and in order to build yourself, you share in a simple manner about what is happening: what you feel, what you see, what you hear. By letting the energy flow through the sounds and the eyes, then during the sharings, the participants generally benefit from regeneration and automatically contribute, in the subtle realm, to the crystal vibrating more and more. When this crystal has reached a certain level of vibration, it reunites with other crystals inside Earth, that are part of the chromatic constrution network. It is the sum of all crystals contained in everything that exists —we speak here of subtle crystals, existing in the energetic dimension. 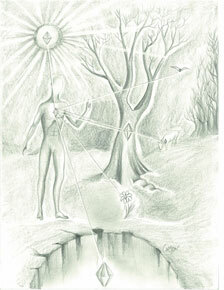 We all have an inner crystal, situated at the centre of our heart chakra, or in other words our energetic heart. This central crystal is connected to all the crystals of our body, which contains billions of them. Together, they constitute the chromatic construction of our body. All beings have their own chromatic construction and each atom of all that is has its own energetic crystal. All these crystals are joined by connections of light. Our inner central crystal, that resides in our energetic heart, is connected to the central crystal of all the other human beings living on planet Earth. It is also connected to the central crystal of each being of each species —animals, plants and minerals— and also to the crystal of Earth. The crystal of Earth is connected to the crystal of the Sun, which is connected to the crystal of our Galaxy, and so forth, endlessly. The tremendous tool that is chromatic construction must be used simply and in all awareness. We only need to be present and to feel the connection between all parts of our being, of the world, and of the Universe, or at least those that we are aware of for now, and at the same tie, keep in mind the deep desire of our soul. Make an act of faith and experiment with chromatic construction. Don’t be satisfied by knowing that it exists, use it.